Twitter has never been a bastion of the Queen’s English, but recent reporting has unearthed a variety of polarizing posts about American politics that are presumed to be of Russian origin, in part because some of them use awkward English. The revelations have led to recriminations against the tech platform and an invitation for the company to testify before Congress this week. The Russians might have occasionally gotten their words mangled, but they were right when it came to mimicking their targets, attacking from both the right and the left. It turns out that American Twitter users who tweet about politics overwhelmingly come from the extremes of the political spectrum as well. Our research surveyed 3,938 Twitter users1 who together generated 4.8 million tweets that we downloaded in August 2016. We then coded the most common 12,000 words based on whether they were political, either because they used an explicitly political term (say, “president”) or a proper noun that was likely to be political (“Romney,” “Maddow” or “CNN”). In all, we found just 293 of the 12,000 words to be political. 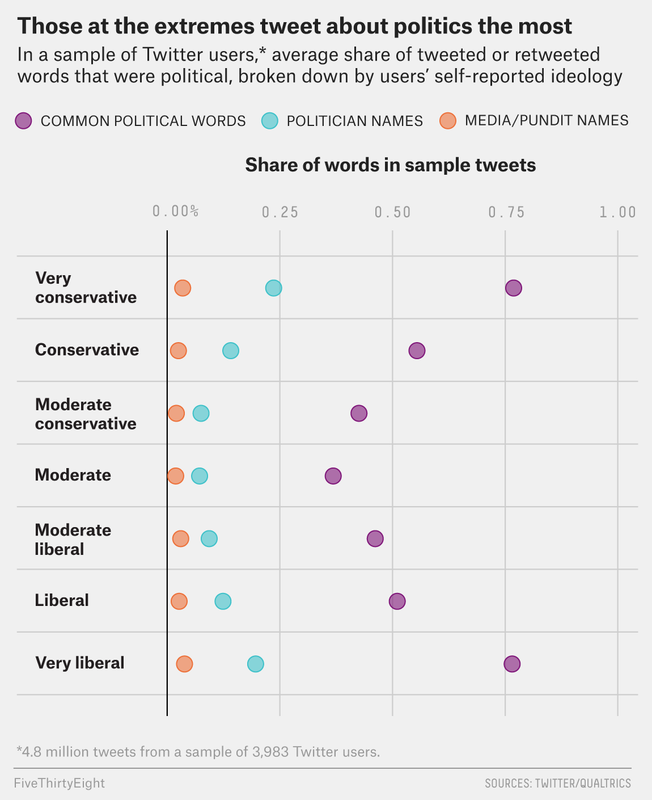 Even though we might expect a sample of Twitter users to be more political than the U.S. population overall, we were surprised to see that the use of political words was concentrated among the small group of respondents who term themselves “very conservative” or “very liberal.” Take a look at at the chart below, which illustrates who is using these political terms. The C-shaped pattern makes the core result clear. It’s primarily those people on the ideological extremes who use political terms with any frequency. In other words, if someone tweets about politics, they are likely to label themselves as on the edges of the American ideological distribution. People who deem themselves “very conservative” or “very liberal” seem to be telling us as much about their level of political engagement as about their policy positions. Strong liberals’ language also tends to include more adjectives, adverbs, conjunctions and comparisons, which may indicate an effort to convey more nuance. Also, some moderate liberals employ sexual terms so heavily in their tweets that they rendered our paper one of the rare computer science papers that would merit an R rating. But what distinguishes even people who are very liberal and very conservative is principally their use of non-political terms, whether those terms relate to religion or sexual orientation. We asked a more representative sample of American adults2 about their Twitter usage and found that as of November/December 2016, just 12 percent of our respondents reported using the social media platform. So Twitter posters are already a distinct minority, and even among those who do tweet, users who routinely tweet about politics are an even smaller and more atypical minority. Political tweeters are even more polarized than the nation as a whole. The long-running panel survey I mentioned earlier.